Things looked a bit dodgy because of the wintry weather but we had a good crowd at the Topic Folk Club in Bradford and enjoyed brilliant hospitality from Tony and Rahel. Poor Steve had to push the car, twice, to help it over some compacted snow but everything worked out very well. Similar story at Bingham Folk Club, with a forecast of 4″ of snow. However, undaunted, all went ahead and over 40 people braved the elements to hear Hicks and Goulbourn – we all had a grand time! Many thanks to the committee, Roger, Christine, Dave Downs for a brill job on sound and Andy Cooper who took some great photos. On Friday 1st February we’ll be at Hinckley ACT, very much looking forward to the evening and a particular bonus this time is that Kim Lowings will be doing support for us. Do check her website. 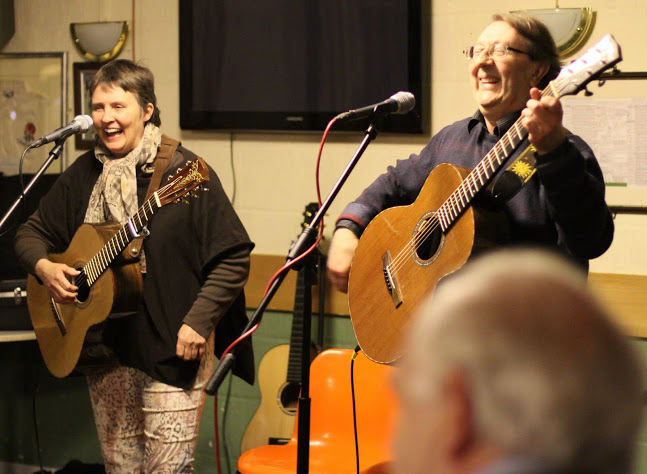 This entry was posted in Uncategorized and tagged Bingham Folk Club, Bradford, Hinckley ACT, Kim Lowings, Steve_Hicks_and_Lynn_Goulbourn, Topic Folk Club by admin. Bookmark the permalink.